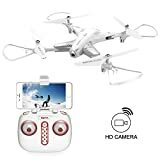 · & #x1F4F7; 720P HD Camera and FPV Real Time Streaming Function: With the 720P HD HD camera, the drone can perform FPV live video streaming seamlessly and bring you a new perspective of the amazing world from the air. It also has a photo taking or video recording function to share with your friends. · & #x1F4F7; Low Voltage Protection and Overload Protection: When the drone battery charge is low, the four indicator lights at the bottom of the drone begin to blink; when the drone encounters a direct impact of a foreign object, or is clogged, or the blades do not spin, the drone will enter in the overload protection mode. Z3 is safer than other drones. · & #x1F4F7; Headless Mode & 3D Acrobatics: Easy flight and don´t worry about the direction of the drone when flying; The drone can entertain you with its powerful 3D rolls at the push of a button, giving you more happiness. · & #x1F4F7; Famous Brand and Quality Control Syma: Syma is the most popular and popular brand in Spain, Syma Z3 is the most modern and modern drone, with foldable appearance, silver appearance and excellent craftsmanship. Release the X5C, X5SC, X5SW syma into your hand and go experience the new Z3.